With the cold weather moving in, many families start to worry if they have everything to prepare their pets for winter. Winter storms pose a serious risk to pet safety as water valves and gates freeze; most driveways become impossible to drive or walk on. The animals can get trapped, slip and fall, or suffer broken bones. Even if the weather warms up after a few days of sub-zero low temperatures, the danger of black ice is huge and walking your dog could require some serious skills and caution. Here are some tips for winter pet safety. 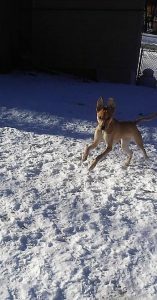 Connecticut Winter Pet Safety -be prepared! If your area is struck by a severe ice storm, are your pets prepared to wait it out until the power is back on? The worst part of ice storms is that you could be stuck in your house with no electricity or communication. So you need to survive a few days on your own and keep your pets safe. Try to draw as much water as you can and use every container possible. Separate them by drinking water and usable water. It is a well-known fact that if you leave your containers open until they reach room temperature and then close them, they will help maintain heat longer. If you have a fireplace, stack on fire logs, as well as other materials that burn, like newspapers, etc. Remember to buy ONLY pet safe antifreeze and ice melt. It will be clearly marked on the packaging. These 2 products can be deadly to pets, cause extreme illness or aggravate tender paws and skin. One major thing to remember is to keep your pets warm. If you might lose heat for the duration of the storm, pick one room that you can close off and keep everybody there. Make sure you have some all-weather fleece blankets handy. It’s a great idea to have an instant heating pad/warmer available that could provide up to 18 hours of instant warmth to keep your pet hypothermia-free. Have your pet first aid kit handy as long as their emergency food supplies and toys to keep them busy. If your home loses power or heat for more than a day, be prepared to move your family, including your pets to a hotel. Having a list of local pet friendly hotels on hand is recommended. Prepacked pet supplies for the move are also suggested. 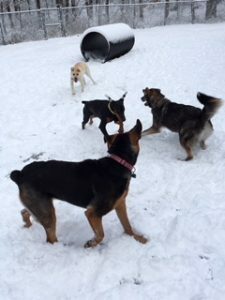 Another alternative is to bring your pet to your local pet boarding facility, pet resort, kennel or daycare- like Wagging Tails Pet Resort & Spaw in Wolcott Connecticut. This facility is equipped with heat and air conditioning AND a generator to power up in the event of a storm. Pets (dogs and cats) are safe and warm during any storm. Staff live on property, so your pet is care for 24/7. Ice storms could be very dangerous if not deadly for your pets, so take some precaution now to be prepared.